Chaurus Hunter Antennae are an alchemy ingredient dropped by chaurus hunters and chaurus hunter fledglings, along with 1 chaurus chitin, a 25% chance of 1 chaurus egg sample, and minor loot. 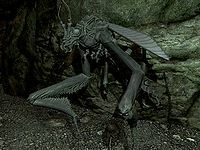 There are no guaranteed samples of antennae, however they can be looted at almost any location featuring the Falmer and their chaurus pets. All four alchemical properties are shared with blue butterfly wings and ancestor moth wings. This page was last modified on 3 June 2018, at 17:46.